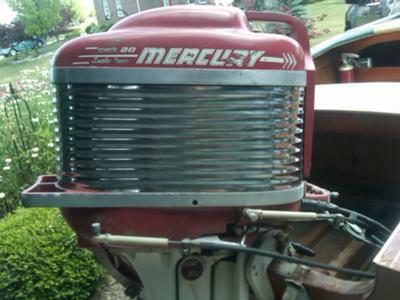 I went to an auction today and purchased a 14' runabout for the 1950s Mercury Mark 30 that was on the back. The boat has a four inch hole where the keel ends at the bow. I bought the boat for the jewelry and hardware as I am going to build the Phil Bolger Diablo and all hardware is in excellent shape. Problem is I have fallen in love with this little boat. Only took the few minutes I spent removing the outboard and some of the choice pieces. Once I strip the rest of the hardware I am going to flip it over and get a good look at the damage. The boat is cold molded and I am not sure how I will get it off the trailer and onto saw horses. I have seen pictures of guys using slings but I do not know if my rafters in my garage could take the stress as they are only 2x4 engineered rafters. 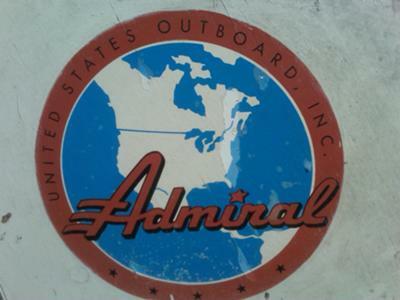 I also do not know the manufacturer as the only sticker on the boat says United States Outboard Inc., Admiral so any help identifying this would be helpful. Google is useless as Admiral brings up all kinds of Navy references and I could not locate anything on US Outboard Inc. Your boat could be in early Sandusky built-in Sandusky Ohio. Russell Boat Company bought Sandusky Boat Company in the early 50s after Sandusky had a fire. Very Sweet boat! Restore it! I had one of these in the late 60's. The model/Mfg name is insignificant. They were popular. What you have is a mass produced "molded mahogany plywood" boat. They preceded the later "bleach bottle" boats. Several manufactures made them in the mid 50's. Weight was ~ 500lbs without motor, tank, windshield for the 14'. They had a "keelson", 2 stringers and a transom. screwed and glued to the plywood. Of course, the hull shape was formed over a temporary frame/loft. - Remove the motor and windshield and all un-necessary weight. Since the boat is light, lifting via straps is not necessary. Just, slide it off the trailer and roll it over. Then, lift up onto blocking or horses one end at a time. It's a one or two man job. 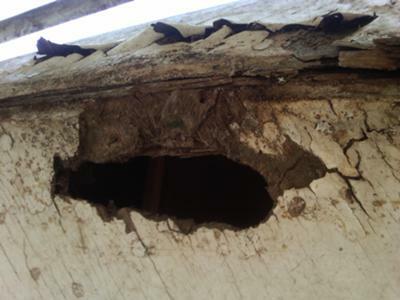 The damage appears to include rot. So, remove the wood and replace it. If the damage is localized one could replace and support the piece backed up by mahogany ribs formed into place. And, use only marine (mahogany) plywood. Feel free to ask questions as necessary. That's not a Chris Craft Barracuda kit boat. I have one, this is something else. Log on to youtube and type in Chris Craft Kit Boat and you'll see what I mean. There was a manufacturer named Barracuda that wasn't Chris Craft. I'm not sure what you've got. In the day there were many small outboard boat manufacturers. Think i know what you have! 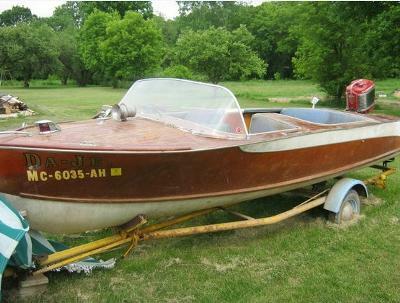 I think you have a Chris craft kit boat 1959-1960 called barracuda around 14ft. I just bought the same boat. The link above will give you a little more information about your boat. I hope this boat is working for you. I am in search of a windshield for mine. Mike that boat in the picture you provided looks like mine. The hardware is all in the same place and the trim looks what is on the boat. Thank you as I could not find anything when I searched. I removed all the hardware from the topside and started labeling the pieces. Started to tear into the bow decking as it needs to be replaced. Yea, she’s a beauty Mike. And wouldn’t it be a shame to part that outboard from her, they just go together sooo well. Dean’s A frame would certainly get her off the trailer. But could you beef up a couple of your garage rafters with some extra timber and props and then use slings? Or use some temporary scaffolding to make a frame the like the one Andrew had done here. Apart from that hole, which I'm sure can be repaired, she looks to be in pretty good shape. Sorry I can’t help with identifying her, keep an eye out for builder’s plate on the interior. But Admiral Boats, United States Outboard, Rockford, Illinois is a possibility??? YOUR FIRST IDEA WAS THE BEST. TAKE THAT FINE ENGINE, ALL THE HARDWARE AND SCRAP THE BOAT. PERIOD, PLYWOOD ISN'T GOOD FOR THE LONG RUN. THE BOAT IS KINDLING! I have done it by jacking up the back with a small jack and rigging some blocking under it, then set a tripod of cedar poles (cheep or free) to lift the front and pull the trailer out. It is a beauty, more pics please.